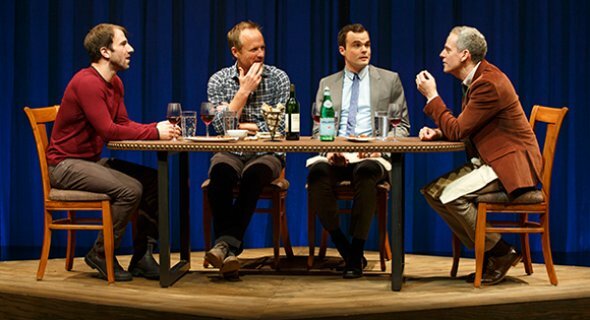 Peter Parnell’s uniquely named play – its punning title taken from the disconnected first words spoken by a child -- is an astutely written, thoughtful and thought-provoking domestic drama about gay parenting. 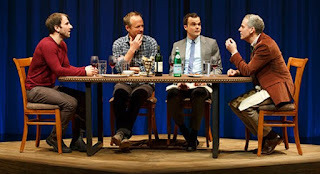 It centers on two married New York couples – Alan (John Benjamin Hickey) and Rob (Patrick Breen), and Scott (Stephen Plunkett) and Jason (Alex Hurt), an artist who finds monogamy a challenge – each parents of preschoolers. They meet at a parents’ group and become friends, sharing their experiences and exploring how children have affected their relationships over the course of one year as their lives intermingle amidst daily drop-offs and pickups from the children's school. In the case of the first couple, writer Alan is disturbed by three-year-old daughter Nicky’s showing his therapist husband Rob more affection. Alan’s sense of alienation ultimately tempts him to stray. But all is not well in the straight world either, as Alan’s best friend, theater composer Michael (John Pankow), seemingly happily married to Serena (Kellie Overbey), reveals at one point he is having a “dalliance” with actress Julia (an amusing Tammy Blanchard), leading to complications. The conflicts that arise among these couples are very plausible, and Parnell’s dialogue is intelligent and quite natural, as it casts observant light on many aspects of marriage equality, relationships, and loneliness. Each actor fits his or her role to a tee. And Scott Ellis deftly orchestrates the cast to bring out all the poignancy of Parnell’s witty and perceptive dialogue. John Lee Beatty’s interlocking set platforms are ingenious and surprisingly versatile as the action shifts from Alan and Rob’s living room to the park to a summer house in the Pines, and elsewhere, complemented by Peter Kaczorowski’s apt lighting. Jennifer von Mayrhauser’s costumes are spot-on for these urban characters.